Nearly 2 years and thousands of yards of lace in the making, our spring 2013 collection Handmade in the UK is now available. 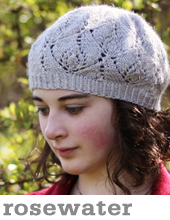 Check out the photos, order the ebook, pre-order your signed print copy, or pick out your favourite pattern today! 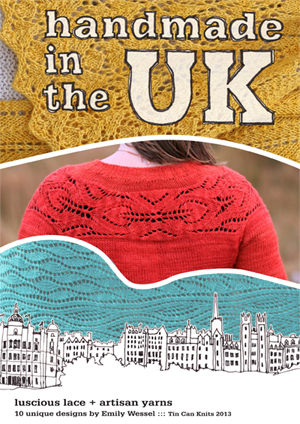 Full of travel sketches, lace knits, and exquisite locally-produced yarns, Handmade in the UK is an aesthetic response to the beauty and pleasure I have found in my new home here in Edinburgh, Scotland. 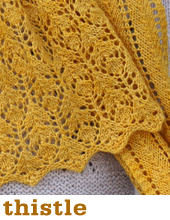 This book has 10 beautiful new lace patterns, and I have so many great photos, stories, and tips to share with you. 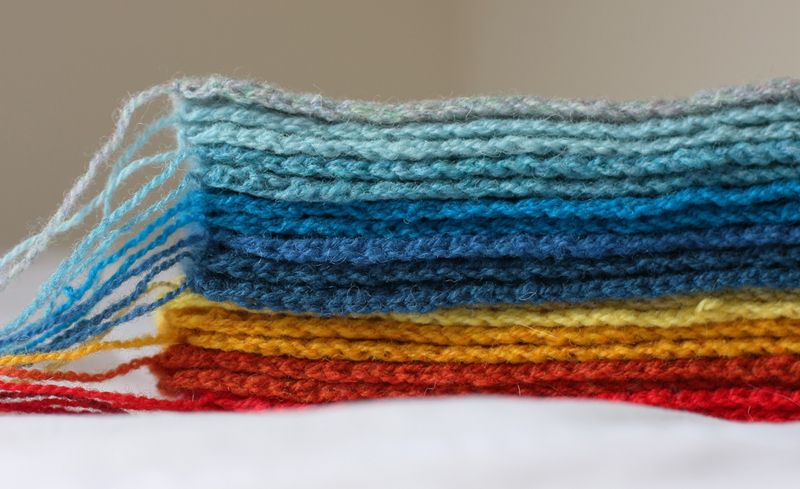 I will begin by showing you Vivid – a colourful new blanket. A last-minute addition to the collection, the Vivid blanket is made in a bright rainbow of yarns. Jamieson & Smith make classic shetland yarns in a vast colour range of beautiful brights and more subtle blended heathers. 2 Ply Jumper Weight comes in 25 gram balls, which is perfect for projects like this, where you want a wide range of colours! I was able to make 2 squares from each 25 gram ball. CONSTRUCTION ::: The lace squares are knit from the centre out, starting with the pinhole cast on [detailed tutorial here], and working outwards to a simple garter border. After blocking each to size, you sew them together using a simple overhand seam, and voila! This construction method is one of my favourite ways to make a blanket, as you may already know from my POP and Dogwood blankets, which use the same techniques. COLOURS ::: I chose a cheery range of primaries – mostly to more orangey reds, and tealy blues; the warmer choices. 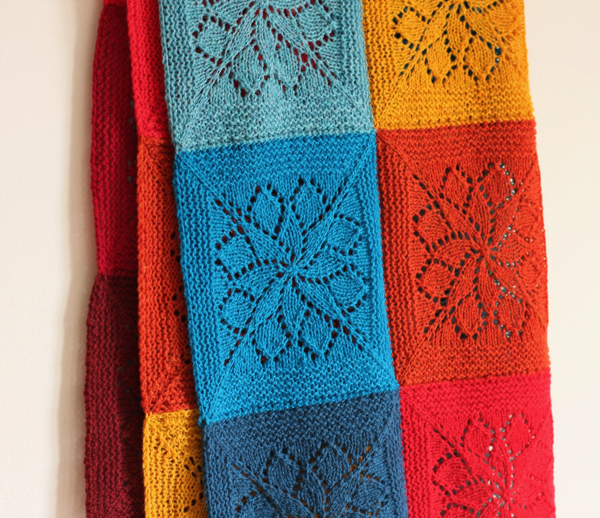 When I designed the pattern, I had intended to work the squares in two colours each (like I did in this early sample), but bright and bold colours I chose lead me to favour simplicity, in the end I worked the squares in a single colour each. I made an equal number of squares in two groups: light to deep blues, and the range of warm colours from yellow through to maroon. COMPOSITION ::: After completing the squares, I tried several arrangements. Separating the squares into cool and warm colours, I tried stripes, a blend, and various checkerboard compositions. I preferred the stripes! Try for yourself and see – subtle differences in adjacency and arrangement can make a big impact in the finished result. FLEXIBILITY ::: Vivid is a great travel project, and is also a great scrap project! This would be perfect for using up sock yarn scraps, or odd balls of other yarn weights (our test knitters tried it in weights ranging from lace to bulky). Alexa is working on a Vivid blanket using a rainbow of Tanis Fibre Arts DK (they have great rainbow packs…), with the garter borders in white. That would make it a machine washable project – great for babies! 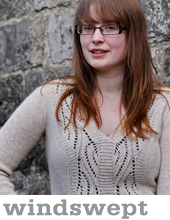 – knit one square, bind off, and block to desired size. 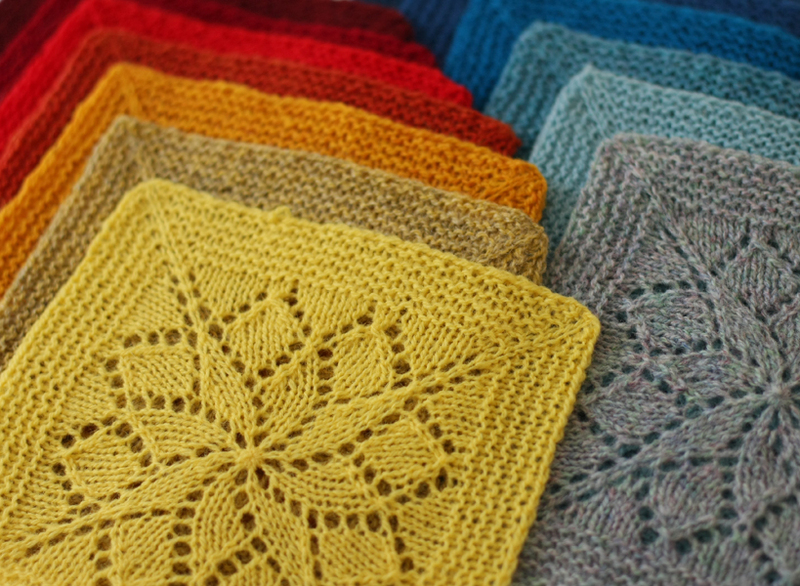 This square is your gauge swatch. Do you like the density of the lace? 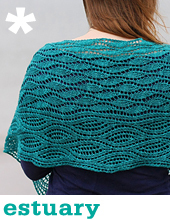 Does the bind-off method you used allow you to block the square sufficiently? – Leave a long yarn end on each square to use when sewing the squares together. 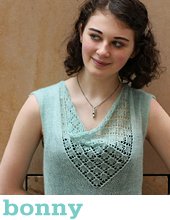 – Test out your seaming method. I used a simple overhand stitch, and I found it looked very neat and tidy. There are several other seaming methods you could try, including the slip stitch crochet method I used in the POP and Dogwood blankets. I sewed each square one to the other using the long yarn ends, creating 4 strips of 5 squares each. Then I sewed these strips to each other. – Block the blanket once more after sewing it together. This will even out any inconsistencies and make for an exquisite finished piece. Love Vivid? If you don’t already get our email updates, you should sign up, and stay in touch! I LOVE it! What to knit first?! It’s another goodie. 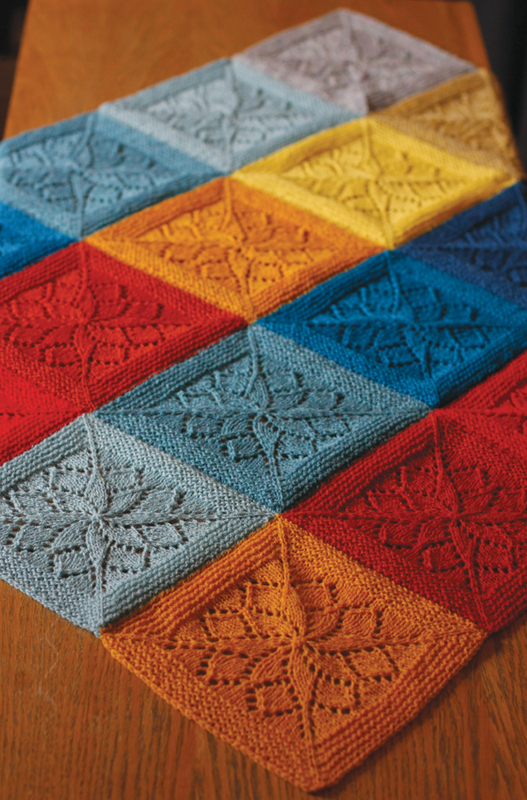 such a gorgeous blanket, and these are amazing tips, especially for a first time big blanket knitter (like myself). thanks so much! I was thinking of pre-ordering the print book. 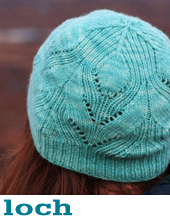 I have no ravelry account, would I still be able to receive the e-book? cheers! If you pre-order the print book now, I can send you an email with a link to download the ebook! 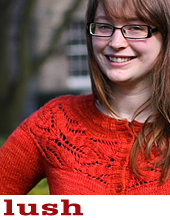 You don’t need to have a ravelry account! Great, I pre-ordered the book this morning. 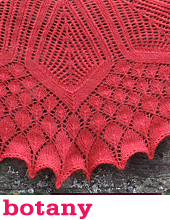 Looking forward to receive the link, I hope to take one of the patterns with me while travelling. Cheers! I have ordered my copy and can’t wait for it to arrive. All the patterns look beautiful, airy and elegant. I aspire to knit like you!